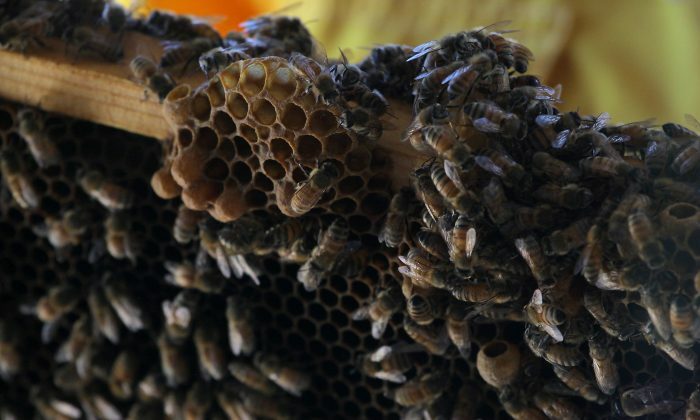 An elderly man in Arizona who was attacked by a swarm of bees was revived in Buckeye, Arizona on April 12. Jerry Mora, who is allergic to bees, was likely stung 20-25 times, according to ABC News. Mora suffered a heart attack while he was taken to a hospital and was put on a respirator. He was listed in serious but stable condition. His wife, Anna Mora, said she and her husband were in the backyard when thousands of bees attacked. She said her husband wasn’t able to make it inside the house, so she put a sheet over him and called 911. “When they got him into the ambulance, he wasn’t breathing and he didn’t have a pulse anymore,” said Det. Doug Matteson, a spokesman for the sheriff’s office. “But while racing to the hospital, some firemen in the ambulance were able to revive him and brought him back to life,” he told ABC. Fire Chief John Valenzuela says firefighters had to suppress the bees with foam. Officials said they had to remove ninety to 120 bees from Mora’s head. “We put him in the back of the ambulance but he was still covered in bees,” Valenzuela said. “En route, this gentleman did suffer cardiac arrest,” he told KITV. The victim’s wife was also taken to the hospital and treated for around a dozen bee stings.